Our “Pictures of the Week” take us to Exits 97 and 100 on Interstate 80 — a detour that may just be the sweetest of them all. A simple white sign directs travelers to the town of Dexter, Iowa, and Drew’s Chocolates. Drew's Chocolates is located on the west edge of town on the White Pole Road, which is a 26-mile scenic and historic byway running parallel to Interstate 80. With nearly 50 varieties of chocolates, you’ll soon forget where you are while your taste buds assure you that you're close to heaven. 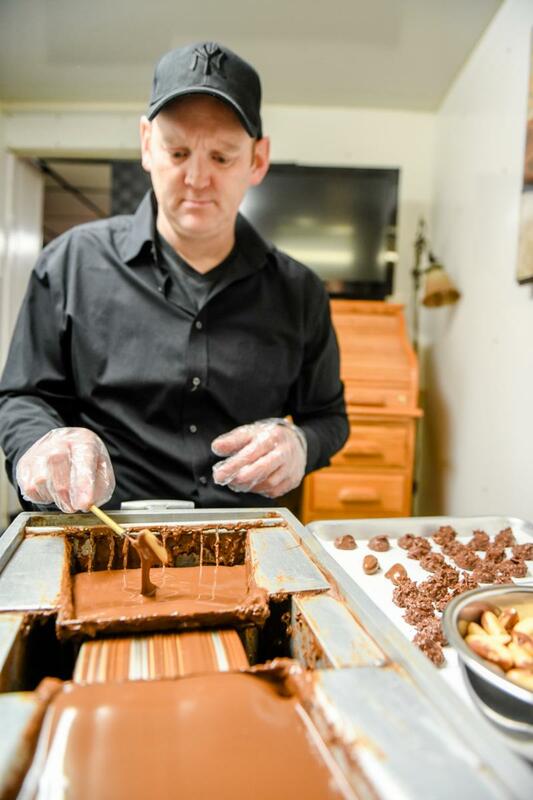 Jason Adams, a seventh-generation chocolatier, works seven days a week to create assorted chocolates ranging from dark chocolate to milk chocolate filled with caramel, fudges, toffee and real fruit creams. Drew's Chocolates has been in the same location since 1927, using original recipes and equipment. If you live in central Iowa, you may be wondering why you haven’t heard of the shop. That might be because the advertising for the business is word of mouth and the small sign on the interstate exit. But that sign brings 60-80 customers to his doorstep every day. Adams was told by the Department of Transportation that the traffic flowing past his signs on I-80 is about 200,000 people a day. “I get to make a living doing what I love, and who doesn't love chocolate! I love meeting new people and seeing families come back to the store generation after generation,” Adams said. Needless to say, the new traffic to his store paired with repeat customers hooked on the chocolate concoctions keep the morsel moving. Every morning, Drew and his employees turn 80-100 pounds of Swiss chocolate blocks into tasty delights. Typically, they will sell 20,000 boxes of their assorted chocolates each year and drop 100 chocolate care packages in the mail every day. As expected, holidays like Valentine's Day and Christmas are busy times. To keep up with demand, the employees will work in advance to prepare ingredients and fork dip the chocolate. Travelers that have visited the store keep in touch with Adams through their Facebook page and he accepts orders for the candy through Facebook messenger and his email at 12927drews@gmail.com. If you need a gift for Valentine's Day, a drive to Dexter for some fine chocolates might be just what Cupid ordered.